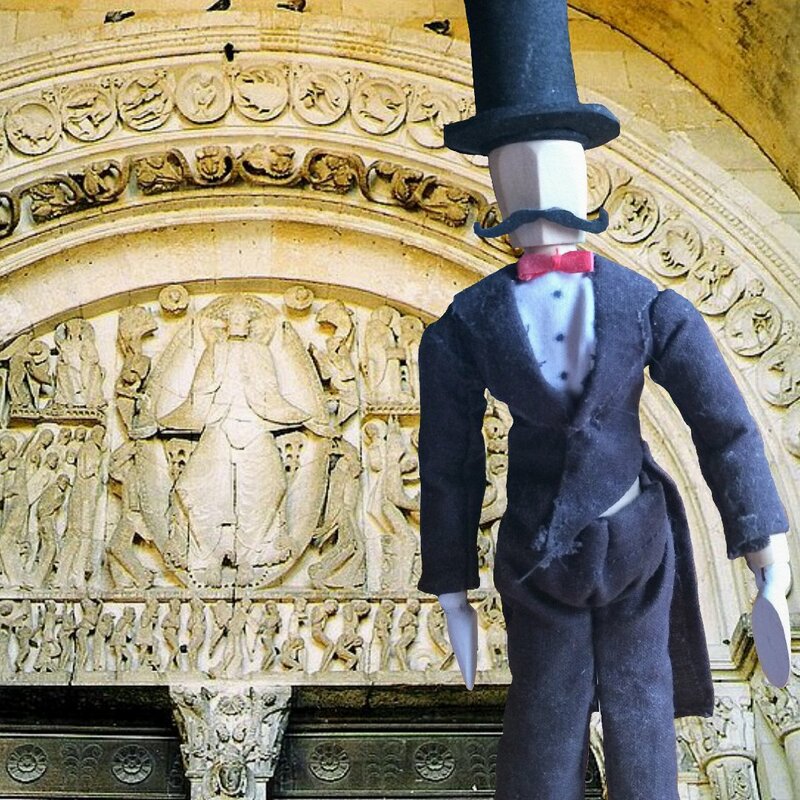 Sylvester is going to start by telling us a bit about Romanesque art. Romanesque means “in the Roman manner.” Most of the art that’s characterized that way comes from the 11th and 12th centuries, and as you can probably guess, the artists of that style were heavily influenced by early Roman art. It was the first style of art to expand across multiple nations in Western Europe. Of course, different areas had their own sub-styles, their own dialects in a manner of speaking. One of the main things that came out of the Romanesque era was architectural sculpture, sculptures carved right into buildings. They were used especially to embellish churches. The Autun Cathedral of Saint Lazare is one of the best known examples of Romanesque architectural sculpture. 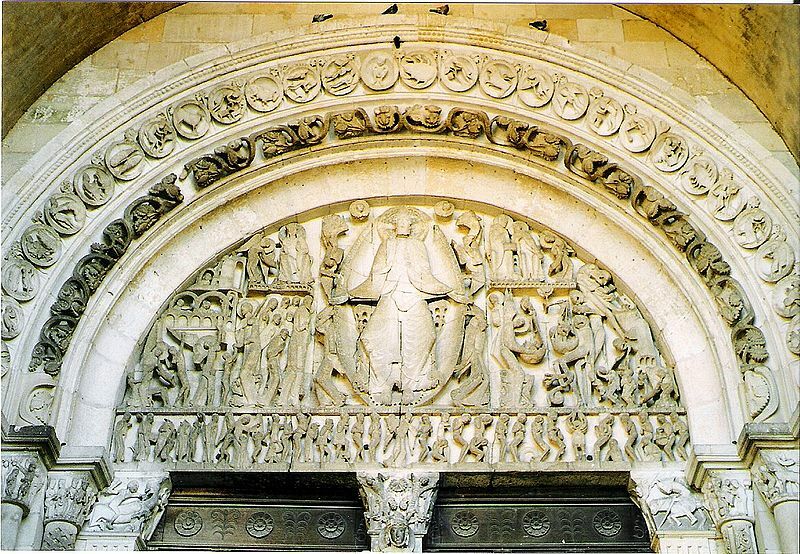 The tympanum, that curved area above the door (which happens to be the west portal–Sylvester assures me that sounds more exciting than simply saying “door”) is carved with a representation of the Last Judgment. Christ is depicted at the very center, and at His feet, the name of the artist, Gislebertus. In the scene, Christ sits between those who will be saved and those who won’t. (Those to be saved are on His right, your left.) We also see angels sounding the trumpets of the Apocalypse. The dead are at the bottom being brought up from their graves, looking up to the Judgment they will soon face. Angels bring the righteous to Heaven, while demons seize the others. The sheer size of Christ compared to all the other figures denotes His power and authority. 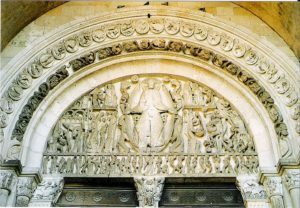 While the Autun Cathedral is one of the most recognized churches for its tympanum, the Last Judgment was a common theme to find on tympanums of many churches. Gislebertus’ Last Judgment scene was created between 1120 and 1135 AD.